When the Nearby API started rolling out to Google Play Services in July of last year, it had a lot of potential and promise. It made it so devices could talk to each other based only on their proximity and regardless of whether or not they were on the same WiFi network (in certain applications) or paired via Bluetooth. That's why we've often said it's the genius feature no one is using. But Nearby in its original form required a lot of involvement from the user. The few apps that implemented the API only used it in specific screens, had to ask for a permission to activate it, and had to show a notification whenever Nearby was on and looking for other devices. It was an active experience, not a passive one, but it got the ball rolling for more. Now Google is ready to extend the Nearby API and it's simply calling it "Nearby." This encompasses Nearby Messages and Nearby Connections, which were previously available, but also adds Nearby Notifications. And that makes a lot of sense. Over the past months, there have been several glimpses of proximity-based experiences on Android, starting with the Physical Web on Chrome 49 (and later in Opera Beta) and ending with the Awareness API that was announced last month at Google I/O. It's the former that is now officially part of Nearby — the latter is still in Preview state and we don't know how integrated with Nearby it is yet. If you've experienced Physical Web notifications in Chrome, you'd know that you usually just get one notification at first asking if you want to be told about nearby pages. After allowing it, you start getting low-priority notifications whenever you are near broadcasting Bluetooth beacons. I've been seeing them in Lebanon over the past three months, so they're nothing new. But they're now part of Nearby, and unlike the first aspects of the Nearby API, they are passive and will show up without any specific activations and after one special permission. You just need to have Bluetooth and Location turned on for your device to become a potential receptor for Nearby Notifications. However, these Nearby Notifications are about more than just the Physical Web (HTTPS URLs). Developers can also trigger app intents (a specific action inside an installed app) and even trigger app installs (when the app isn't already installed, you get directed to the Play Store to download it). 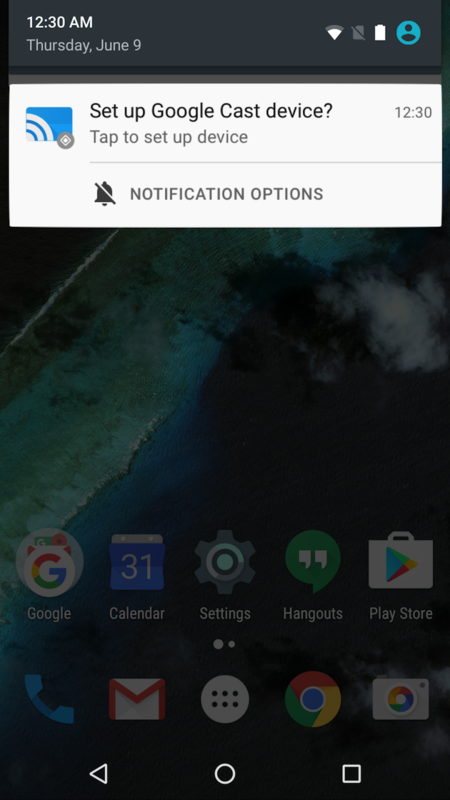 There are more details about this in the Developers documentation page, including step-by-step guides for configuring Eddystone beacons to broadcast these different types of notifications. Google already has launch partners for this reinvented Nearby: United Airlines will suggest you install its app pre-boarding and let you watch movies and TV shows while you're flying, The Broad Museum and The University Of Notre Dame give you access to in-app tours while you're visiting them, CVS lets you order and print your photos quicker, and so on. Google itself also seems to be taking advantage of the feature, by giving you notifications to set up Google Cast devices and Android Wear watches when you're near them. That should simplify the process a little more for new users. It could seem spammy if everyone starts buying Eddystone beacons and triggering these notifications, but my past experiences with the Physical Web ones tell me that you may not even notice they're there. These were programmed to be low-priority notifications — often times they won't even ping or vibrate your phone. And as far as I remember, they disappeared by themselves when I walked away from the beacon that was sending them. (I'm not 100% sure about this part, so correct me if I'm wrong there.) So all in all, they could improve your experience if you want, and mostly stay away if you don't. To benefit from all these new features in Nearby, you don't need to do anything as a user. They will be part of a Google Play Services update that's coming to all Android devices on KitKat and above. As for developers, you should watch the Google I/O presentation below and get started on the Nearby documentation page to choose the kind of experience you want to work on.